Born in Guadalajara, he studied painting with Roberto Montenegro and Jesus "Chucho" Reyes. Considered an important talent, at the early age of 16 he held his first solo show. In 1935, once in Mexico City, his work was instantly recognized as having artistic potential. A year after that he joined the Liga de Escritores y Artistas Revolucionarios (LEAR). His first trip to Europe was in 1950, when he moved to Rome for two years. It was in Italy where he developed a passion for sculpture. His first works were in ceramics and terracotta. 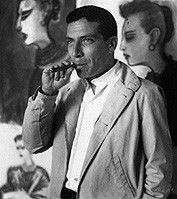 Back in Mexico he developed new styles achieving artistic maturity, which is further reinforced when, in 1956, he visited Greece and later established himself in Paris. A retrospective of his work was held in Mexico City in 1983. In 1990 the Museo de Arte Contemporaneo de Monterrey, one of the most important and best-known museums in Mexico commissioned Soriano to make a monumental sculpture, La Paloma (The Dove), to adorn the entrance to the marvelous building designed by renowned architect Ricardo Legorreta. Juan Soriano died on Friday, February 10th, 2006 in Mexico City.